'md-input' is not a known element: If 'md-input' is an Angular component, then verify that it is part of this module. If 'md-input' is a Web Component then add "CUSTOM_ELEMENTS_SCHEMA" to the '@NgModule.schema' of this component to suppress this message.... inline template:13:32 caused by: md-input-container must contain an mdInput directive. Did you forget to add mdInput to the native input or textarea element? To apply material design to the input controls (input and textarea elements) the md-input-container element is used. Furthermore the mdInput directive is attached to input and textarea elements. In addition a md-hint element is used together with the input element for the postal code information.... inline template:13:32 caused by: md-input-container must contain an mdInput directive. Did you forget to add mdInput to the native input or textarea element? The mismatch in styling between inputs and selects has been an ongoing issue in Angular Material. It was just recently solved by sharing as much of the css as possible and this triggered the change from md-input-container to md-form-field. how to build a ice rink on grass I have a basic example with angular material datapicker: I would like to know, if is possible to use this plugin for to load a date in three different inputs elements. Which version of Angular and Material, and which browser and OS does this issue affect? , suggestions how to fix) 👍 24 jelbourn changed the title input validation system (ngControl support) (CSS) Add guidance for styling invalid inputs Apr 25, 2016. jelbourn added the feature label Apr 25, 2016. how to add text boxes in google docs I have a basic example with angular material datapicker: I would like to know, if is possible to use this plugin for to load a date in three different inputs elements. @marcysutton I've updated the Plunker to Angular 1.3.15 and removed hammer.js. It is still using angular-material master as it was previously. This last test was done with against cbbdf74 which includes 0.9.0rc3. Angular Material supports different types of input elements like color, date, email, month, number, password etc. 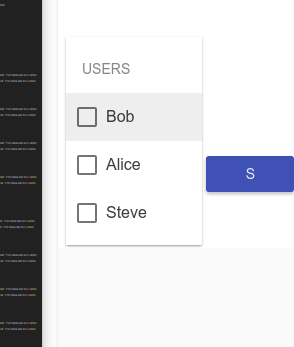 In this article, we are going to use the input components to create a Create-Owner component and use it to create a new Owner object in our database. I'm trying to work around a known bug in Angular Material for autocompletes, where adding any classes to the autocomplete aren't carried down to the md-input-container child elements.